TheraBreath was a unique review opportunity for me. I've tried other halitosis/bad breath items before without much success. Many of the other things I've tried tasted so bad that I couldn't even use them. What a refreshing change!! TheraBreath has a mint flavor that isn't overpowering, but tastes nice. I was sent the Toothpaste, Oral Rinse (like mouthwash) and the Mouth Wetting Lozenges. The Toothpaste & Oral Rinse cost $10.50 each; while the Lozenges are $13.00. I've been battling a sinus infection off and on since February. One symptom I have is lots and lots of coughing. I'm so sick of cough drops I could gag on them. 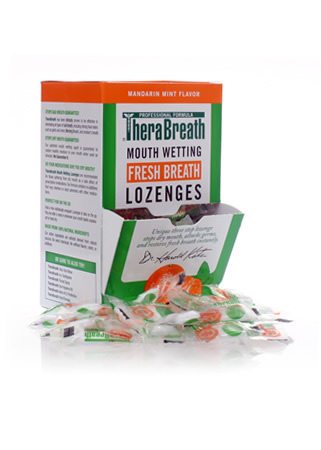 I started using the Mouth Wetting Lozenges in lieu of cough drops off and on during the day. It was nice to have a decent flavor, know I was wetting my mouth and throat and still fighting off the incredibly bad breath being caused by the infection. While it didn't always stop my cough (not what they are designed to do), it was just nice to have something other than a cough drop in my mouth. What I really appreciated most is that it is dentist approved oral care (won't damage teeth), yet it helps reduce and solve the problem of bad breath. My husband said it did help freshen my breath. Most of all, I liked the clean taste in my mouth. If you'd like to see videos regarding Dr. Katz and the TheraBreath products, visit their You Tube Channel. In addition, get more information at the TheraBreath Blog. 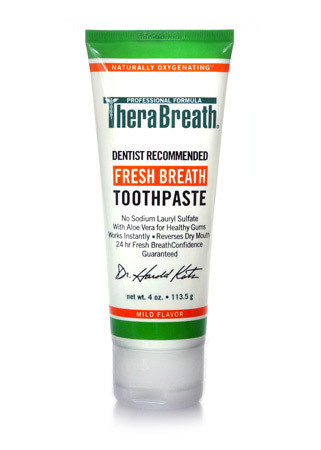 Win TheraBreath Mouthwash to try for yourself. Follow TheraBreath on Facebook and on Twitter. If you do not have both accounts, indicate that in your entry. PLEASE NOTE: You must leave a way for me to contact you. If you aren’t a blogger, use the anonymous comment form to enter and leave an email. This is a Mama Buzz review. I received products to sample or the purpose of this review.